COLUMBUS, OH--(Marketwired - December 15, 2015) - When an active shooter strikes, every second counts. The sooner law enforcement can respond and the more information they have, the more lives can be saved. 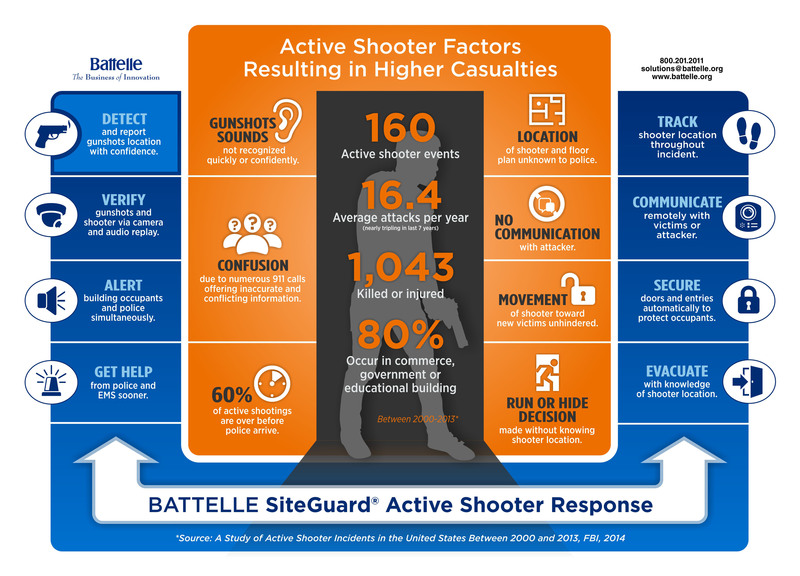 The Battelle SiteGuard® Active Shooter Response (ASR) provides a high tech, integrated approach to help protect building occupants and first responders during an active shooting by reducing or eliminating delays and human errors that often occur. Battelle, the world's largest non-profit independent research and development organization, has successfully tested the SiteGuard® ASR system at a high school near Columbus and will be demonstrating the system to law enforcement, security and building development authorities later this month. It combines gunshot sensors with building security and communication systems to provide critical information to law enforcement and building occupants. Like smoke detectors, sprinklers and other safety systems, SiteGuard® ASR automates and accelerates 911 calls and mass notifications. As soon as the sensors detect a gunshot, SiteGuard® ASR activates a series of predetermined actions and automated responses vital to occupant and first responder safety and optimized response. "While we may not be able to prevent these tragic shootings, we can give law enforcement technology that helps them respond more safely and effectively," said Ed Jopeck, a Senior Program Manager for Battelle and leading security expert. "In 10 or 15 years building systems like SiteGuard ASR will be as common as smoke detection and fire safety systems are today. They can help authorities to locate, detect and respond to gunfire more effectively, which can help save lives." SiteGuard ASR uses high tech sensors and software to locate the shots and send automated pre-recorded 911 calls for help, while automatic intruder alarms and mass notification systems go live to alert building occupants. SiteGuard® ASR maps the locations of the shooters and tracks their movements, quickly providing critical information about the building's layout to authorities. It also provides the number and location of shots fired and helps users determine the number of shooters and even the type of weapons. When integrated with building video systems SiteGuard® ASR can help authorities determine the path of the shooter and advise occupants to seek cover or evacuate. A two-way voice communications system in the next generation of SiteGuard ASR will permit communication with the shooters or building occupants from a remote location, and assists in situational awareness and triage of those needing medical evacuation. An optional feature includes the ability to close and lock doors that would deny the shooter access to additional victims. Lt. Ron Wright of the Reynoldsburg Police Department said this technology would cut down on delays and could remove human error. "If you have a pretty good idea where the active shooter is located, you can concentrate the resources and get them inside as fast as possible," he said, adding the extra knowledge of the shooter's location and actions also would make responding safer for the police. "Every little bit helps to provide the quickest and most efficient response." To view one of the demonstrations or to speak to Ed Jopeck now or in the future, please contact Katy Delaney at (614) 424-7208 or delaneyk@battelle.org. 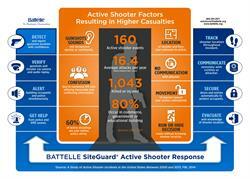 This Battelle infographic details how SiteGuard Active Shooter Response provides a high-tech, integrated approach to help protect building occupants and first responders during an active shooting.